His first two characteristics that were apparent from an early age were an independence of thought and an ability to ensure that you knew he existed. Unlike most first babies he arrived early and at a time that was most inconvenient for the family. He caused Jenny much sickness throughout the pregnancy and arrived a week early on Boxing Day after he decided Jen’s Christmas cake was not to his liking! That he inherited this stubbornness from his mother is clear when you hear that she refused to believe he had decided to make his entrance during a half hour telephone call with a midwife at 2am! It is safe to say that Richard was not a good sleeper and that he never appeared to need much, well at least not during accepted sleeping hours. I have not had the privilege of asking his RM buddies if that still is true today, but as a baby and child he clearly thought that sleep at night was a not a cool thing to do. He woke up at 0300 on his first Christmas and bawled for over an hour. So Robin and Jenny got up, Robin walked the dog while Jen got the family ready and they, drove to Robin’s parents (Richard sleeping all the way) for an early Christmas call at 0700 as opposed to 1100 as they had been invited for. However Richard was not finished yet. He ate his first Xmas dinner in his high chair and then promptly fell asleep in his food bowl for the rest of the meal. Havant in his early days, then Horndean, before semi professionally for Fareham Town. He was very skilled and captained Hants Youth. He did have one weakness though and that was for breaking bones during matches. Twice he broke legs and, like the true RM he would later choose to be, he even tried to continue playing on one of these occasions to see: if it hurt. Again like a RM he found out! He was passionate about footie and Man U in particular as you can read in the tributes from his mates on websites and he would have been bitterly disappointed with the England performance in the World Cup. I know that he would have cared more about England winning than the danger he was in every day in Helmand. He also twice broke arms for good measure. The first occurred whilst trying to walk a dog twice his size and strength. Typical of Richard he would not give up until his arm was broken! The second time was from doing stunts on a bike. He complained so little that he was made to play cricket with the broken arm, a typical bootneck. Aged 8 he once fielded for US Portsmouth in the Southern cricket league at Liphook. Robin and I were both playing and my step father could not field. It was a proud day for both of them and we saw the early RM promise. In a high quality man’s game he never flinched once and did not let a single ball go by him. You might, by now, get the impression of a young man who favoured sport over his academic studies and you would be right. He studied Public Services and PE at South Downs College to A level. He hated doing all the writing and indoor work, so after one year he gave up PE. As his college report states: Richard has given up PE so that he can concentrate all his efforts at skiving off from Public Services. But Richard was a bright and intelligent young man who just did not fit the academic life, but he was perceptive and able and held well thought out opinions on most subjects. However it must be admitted that sport, girls and socialising were his favourite subjects. These interests highlight the next two characteristics that were large in his life: the ability to make friends easily and loyalty to his friends and family. 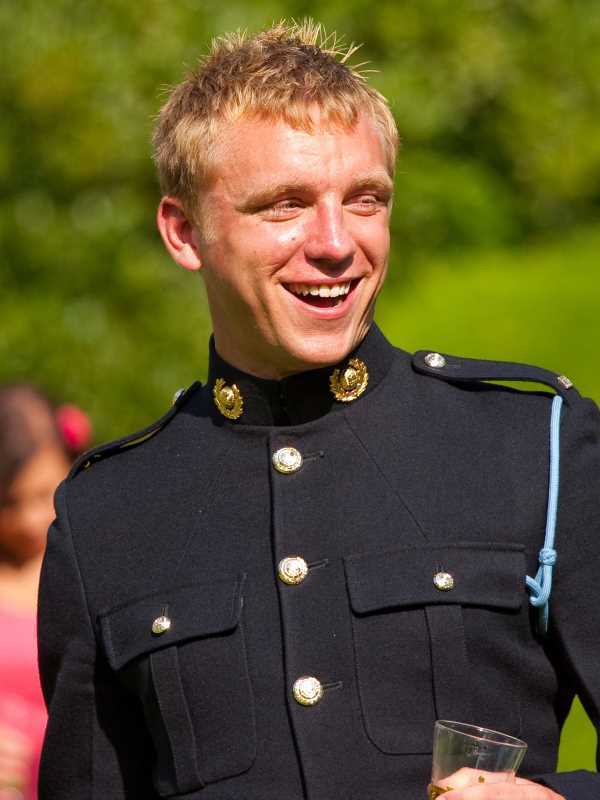 Marine Richard Hollington was one of my finest. He was bright, intrepid, determined and full of character; he was very much at the heart of 11 Troop. A very talented footballer and magnificent marine he had a lot to be proud of, yet I knew him to be an affable, generous, loyal and modest young man. He was gregarious and well-humoured, and in the privations of life in Sangin, he was invaluable. It takes extraordinary courage to be at the front of every patrol but Marine Hollington did so with the professional pride that gave confidence to others. and I saw for myself the regard with which his friends from both home life and the Corps meant to him and it is clear that he was a very popular man who was at the centre of life and bubbling with humour and fun. But he was not just a leader and protector of his family and friends. Richard possessed kindness, compassion and a gentle side to his character that Jenny, his Mum, adored. No mum should have to see this day. With Richard goes a part of her, the part that tempered the warrior and turned him into a hero that others admired and looked up to. She was proud that whatever scrapes he got into he never made the same mistakes twice, he apologised when wrong and looked after those less well off than himself. His King’s Squad Pass out at CTCRM on 26 Sep 08 was a bitter sweet day for Jenny, but as she said to me last week: It was what Richard wanted to do and it made a man out of him. This generosity of spirit and care of others can be seen in his demand that his organs be donated. Today a 52 yr old father of two has life because of one of Richard’s kidneys and a 19 yr old has the other. 2 more have sight and a whole host of babies have good hearts now thanks to R. If he cannot be with us then he, at least has spared some others. Richard was also impulsive and he liked a flutter. His attitude was that he nearly won £1,000, not that he had just lost £100. As he became a man he continued with his love of friends, golf now, beer and poker. He loved driving and after the driving course at Leconfield he wanted to drive everything and did. When the family moved here from Portsmouth he worked behind the bar at the Seven Stars where we will all go after this service, and this was probably where he picked up his skills at banter and fun. He became extremely friendly with Antony Ellis and together they plotted their lives in the Forces. Richard decided to follow his uncle Simon and Dad into the Corps which was a very proud day for them all. He kept his familial ties so quiet that it wasn’t until his pass out parade that the then Commandant Brigadier Bill Dunham who went through both training and university with Robin wasn’t aware he was even at CTCRM. Training was tough, but he was one of the few who manage to compete it without a break, even though he survived the gruelling final 5 weeks with a serious hamstring injury. So the early days of playing sport with broken limbs came in useful after all. Before Richard’s grievous injury he had had a very exciting tour in Sangin. One day on patrol and in the lead as ever, there was an explosion behind him. His first thought was that he had failed to spot an IED, he was relieved to find out that one of the section had suffered a minor grenade injury. His relief soon turned to anger as he realized that the injured Marine was wearing a spare pair of his trousers typical bootneck reaction! Even worse for Richard, the injured Marine got to meet David Beckham later in Camp Bastion! Later he was topping up his all over tan (as testified by the nurses at Selly Oak) when three mortar rounds were thrown over the wall of the patrol base, fortunately not exploding. Richard was a very young man when he was cruelly taken from us. His courage, generous character and wonderful attributes have been praised by all those who knew him. Not one of us knows what he might have become, but all of us know that our lives are richer because we knew him and that the sense of loss is huge. In his short life he managed two things that few can achieve at his age: the unconditional love of his family and the respect and unconstrained comradeship of his fellow RMs whatever their rank. He was untainted by age and experience and was still, in many ways, an innocent young man with the greatest potential.